All important terms in palynology are listed here and explained. 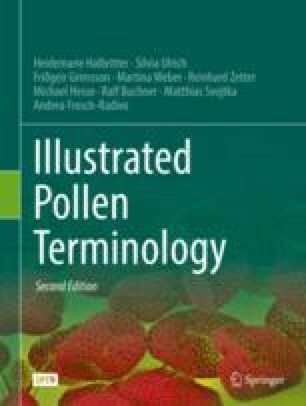 Terms figured in chapter “Illustrated Pollen Terms” are indicated by bold page numbers. Non-recommended terms are only provided with an explanatory comment. For consistency, phrases are standardized, for example, features of ornamentation are stereotypically defined as “pollen wall with …”, and pollen wall features (or pollen shape and size) as “pollen grain with …”.